Mahi Mahi Skewers with Jalapeño, Key Lime, and Pineapple are healthy, easy, and so delicious ~ make them in the broiler or on the stove top all year long! Cut the fish and the pineapple in similar sized chunks, about 1 - 1 1/2 inch square. Cut the limes in half. 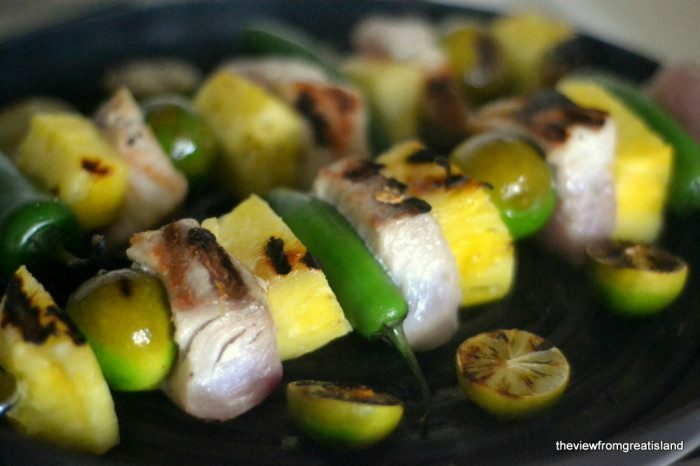 Thread the pineapple, Mahi Mahi, 4 of the limes, and the whole jalapenos on long skewers. Season with salt and pepper, and brush with olive oil. Heat a grill pan over medium high heat until it is quite hot. Grill the skewers until the fish is done through, this will only take a few minutes per side. I like to make sure everything is touching the grill for nice even grill marks. Once you set the skewers down, don't disturb them for a few minutes, Then carefully turn and grill the other side. When the fish flakes, it's done. Throw the remaining limes on the grill at the last minute, cut side down.